Navegador is a medium complexity board game for two to five players from designer Mac Gerdts that plays out in around two hours. You should be able to find it for around £30. 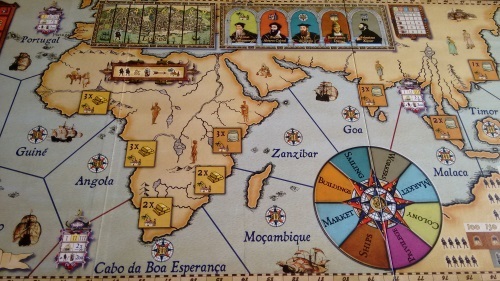 Typical of Gerdts’ games, players use a shared rondel mechanism (more on this below) to sail their ships from Lisbon to Nagasaki, buying and selling goods and expanding their business empires in the 15th/16th Century Portuguese colonies. 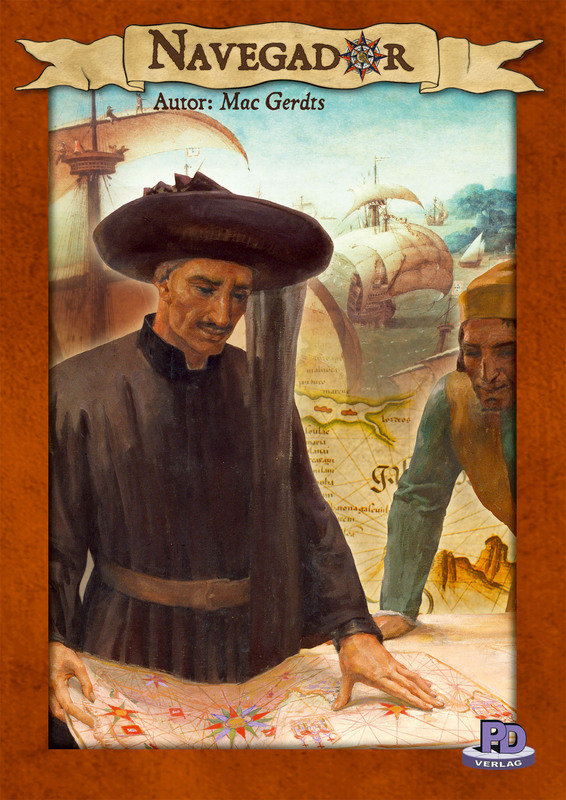 The game is awash with all the typical ‘euro’ stereotypes: a dour looking man on the cover, a washed-out brown board and a trading in the Age of Discovery theme. 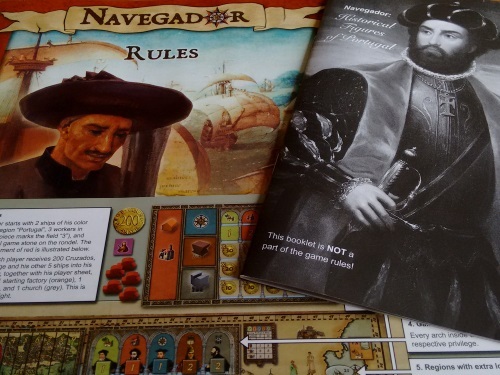 But as Navegador is most definitely a euro game, why shouldn’t it wear its credentials on its sleeve? In fact I think the board itself is evocative of the theme and lovely to look at, while the rest of the game’s components (around 100 small wooden pieces, a few bag-fulls of cardboard money/chits and five sturdy player boards) are above average if not remarkable. And as always with Gerdts’ games, the eight-page rulebook is complimented by both a handy setup/action description reference sheet and a great little booklet full of historical facts about the famous Portuguese figures of the time that are represented in the game. In terms of game play, Navegador is one part exploring, two parts empire building and three parts buying cheap and selling high. Exploring lets you set up colonies – and subsequently sell their goods. You can also buy shipyards, churches and factories to process these goods, with the player who can most successfully time and manage its investments the most likely to come out of Navegador on top. 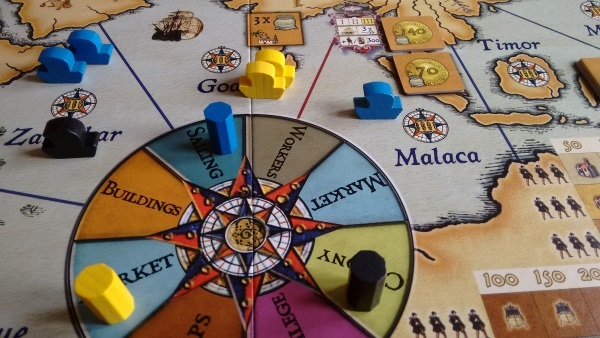 Navegador is a pretty easy game to teach, but a tough one for some players to get a handle on – especially if they’re not used to games with a commodities market. The rulebook is a mere six pages of A4 with more examples and pictures than rules, while the game has no hidden information – making it simple to help players that are struggling. Gameplay revolves around the board’s ‘rondel’ – a circle split into eight sections, each of which contains one of the game’s seven possible actions (the ‘market’ action appears twice on opposite sides of the rondel). Players decide which action to take at the start of the game by placing their player piece on the appropriate rondel space. On subsequent turns a player will move their piece up to three spaces clockwise around the rondel, limiting their options dramatically. You can push further round the rondel, but only at the cost of one of your ships – which don’t come cheap. But if another player beats you to that spot, will it hurt even more…? Most actions in and of themselves are straightforward: buying ships, privileges (for end game scoring), buildings, workers; sailing or founding colonies: but the market can be the tricky part to teach. Each colony founded and factory purchased will trade one of the game’s three goods (sugar, gold and spices). When landing on a market action on the rondel a player may deal in each of these goods, but only in one direction – so if they choose to sell sugar from a colony they could not use any sugar factories they own. Unfortunately the market on the board isn’t as clear as it could be for new players, with factories given a solitary column which has never failed to confuse at least one player if I’m teaching the game. But overall this is a very small barrier to entry and as mentioned earlier, it is easy to help new players with this action as all of their factories and colonies will be in full view of everyone. The writer: Gerdts’ games are renowned for their short, snappy yet agonising decisions and Navegador is no different. Despite having just one action per go, especially at higher player counts your best laid plans can be scuppered between turns, forcing you in a completely different direction. And the game is beautifully paced, arcing from an initial land-grab through consolidation to the final race to either end the game or get ahead before someone else does. The thinker: While this isn’t my favourite Gerdts game (I’d go for Imperial 2030) there is a lot to like. To play well you need to be thinking about the long game from your very first move, with the limited end-game scoring tiles up for grabs at very specific moments. But then there are tactics required too, as the play of others can certainly force you to change tack anywhere up to the start of the game’s third and final movement. I’d prefer a little more depth and crunchiness, but enjoy my plays. The trasher: Much like Gerdts’ Concordia, Navegador is a game I’d play at a (big) push but wouldn’t seek another play of. There is some competition for scoring tiles, colonies and cheap factories but its more of a race than having proper interaction and for me it all felt very dry and, well, brown – I’m the kind of player that can see a spreadsheet when others can see a game and I’m not here to work, I’m here to roll dice, get dirty and mess with your head! The dabbler: I found this surprisingly enjoyable and the turns zip along super fast, meaning there is practically no down time. The theme isn’t great but the board is gorgeous, the rules simple and there are lots of ways to get points. You really have to keep an eye on what other people are doing, and we tend to find someone is always moaning about this or that or demanding we stop the perceived leader from getting a cheap colony or building. Just avoiding playing with AP people! Criticisms – and there are plenty – should be taken in context of Navegador being in the top 100 games on Board Game Geek (as of April 2015). The game certainly doesn’t have universal appeal, but as a fan of euro games I could predict these from a mile off. The majority of detractors say the game is ‘boring’ or ‘dry’; that it’s like filling out a spreadsheet or solving a puzzle – especially as there is no direct interaction. As always there are merits to these arguments and if you have tried and hated Gerdts games such as Concordia and Hamburgum, or generally don’t like euro games with little interaction, it is highly unlikely you will be a fan of Navegador. A bigger concern is the accusation that the winner will be the player who simply follows the road less travelled; the old adage of ‘do what the other players aren’t doing’. Again there is truth in this, as this is a game with several paths to victory points and if the players let one of their number exploit one of these alone it is likely they will prosper. However, it really is the responsibility of the other players to spot and stop this and personally I don’t see it as a flaw in the design – but some will. Having discovered and fallen in love with the rondel games of Mac Gerds through his earlier title Hamburgum, I’ve found Navegador to be a refreshing and fulfilling small step up in complexity and enjoyment. The rondel works in a similar way in both games, but I find both the end game scoring and (admittedly abstracted) player interaction more enjoyable, while overall the game simply looks a hell of a lot better on the table. If you enjoy euro games from designers such as Stefan Feld or Ted Alspach, or are looking for a step up in complexity from lighter weight games such as Ticket to Ride, Carcassonne and Catan, I’d highly recommend Navegador – with the caveats mentioned above around player interaction. for those seeking a more interactive experience, but are intrigued by the rondel idea, check out other Gerds classics Antike and Imperial 2013 which feature combat/area control and stocks/area control respectively. This entry was posted in Board games, Games and tagged board game, Board game review, board games, boardgame review, euro game review, Gerdts, Mac Gerdts, Navegador, Navegador review, rondel by Chris Marling. Bookmark the permalink.